Dr. Smith's ECG Blog: What kind of AV block is this?? And where is the coronary occlusion?? What kind of AV block is this?? And where is the coronary occlusion?? For couple very interesting related posts, click here. Rhythm: slow and regular. p-waves are not conducting down to ventricles. This was initially diagnosed as complete AV block. What is it really? ST segments: There is obvious inferior STEMI, with ST elevation (and Q-waves and T-wave inversion) in II, III, aVF and reciprocal depression in I and aVL. Where else is there ST elevation? Where is the occlusion? First, the patient was hypotensive, which should clue you in to Right ventricular infarction. The ECG diagnosis of RV MI is made by ST elevation in lead V1. Indeed, at angio, there was a proximal RCA occlusion. Notice the p-waves are inverted! Thus, they are retrograde. (or there is a low atrial pacemaker and 3rd degree block, and sinus brady, and junctional escape). Look closely: p-waves are progressively later after each QRS. Thus, the R-P interval is increasing. This is junctional rhythm with retrograde Wenckebach (RP interval steadily increasing). Unfortunately we do not have a long enough rhythm strip; if we did, it would eventually show a dropped p-wave!! 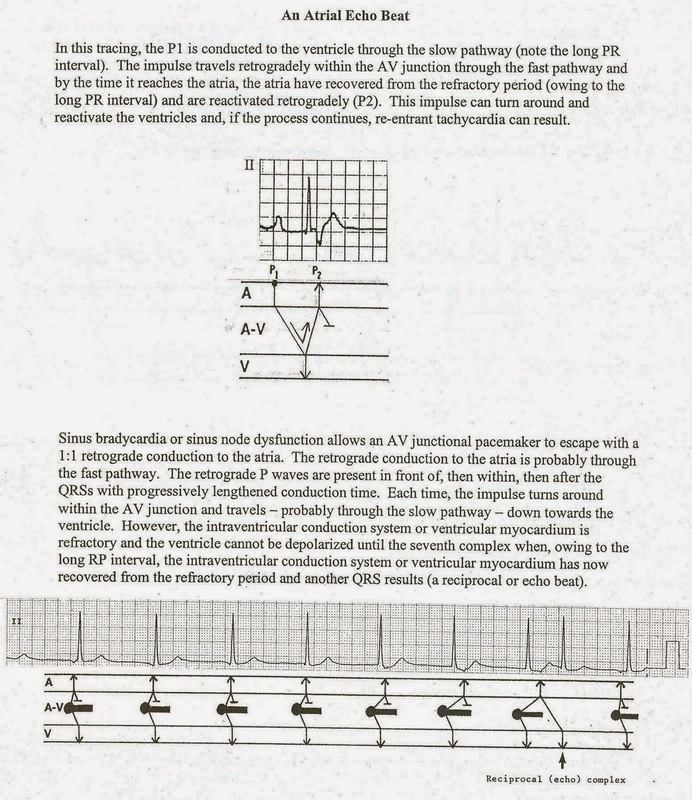 For a comprehensive explanation, I have copied below (with permission) from Kyuhyun Wang's great Atlas of Electrocardiography. 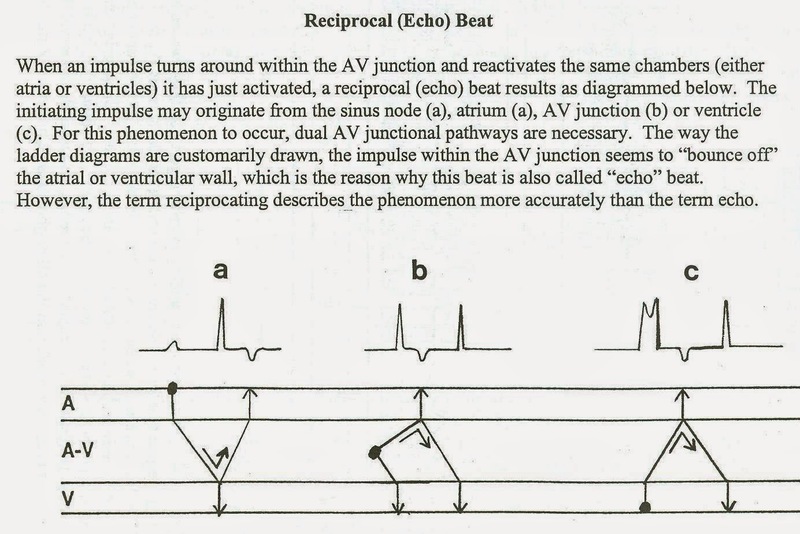 Here he explains it in the context of an "echo beat". First, he explains the echo beat, then he shows a case of retrograde Wenckebach with an echo beat. Very interesting case, I too jumped on 3AVB. Is Wang's text still in print? I'm having troubles finding it online. Unfortunately, it is self published and only locally distributed. Might be able to get you a copy, if you want. I would certainly like one! What do you say, Christopher: rock, scissors, paper? K. Wang will see if the U. of MN bookstore will take orders and ship. If so, you're all in luck. I'll keep you posted. It's a fantastic book. Excellent case. I too would be interested in knowing if U of MN would ship. I would happily call up and order it! Too far of a drive from Joplin. I will keep all posted about K. Wang's Atlas. My thoughts were that with the atrial and ventricular rates being so similar, complete disassociation would be unlikely. Feedback would be appreciated as I am fairly new to the game. One may often be fooled into thinking there is complete AV dissociation when the p-wave and nodal escape are at the same rate and just happen to occur around the same time, so they are both firing on their own automaticity (i.e., the sinus is not being fired by the AV node, nor is the AV node being fired by the sinus, because each occurs before it can be influenced by the other). That is not the case here. any news on availability of dr. wang's atlas? did i miss it? thanks. Does the ECG have a left posterior fascicular block, sir? As far as I know, the posterior fascicle is much more sparsely distributed than the anterior one, thus, a large amount of myocardial tissue must be damaged to block the posterior fascicle. So I have a question sir. In case of acute inferior MI, may a new LPFB be a hint of RV involvement? I'm not absolutely certain, but that would not make sense. RV is not near any part of the Posterior fascicle. Is it MI or pericarditis?